If you are not familiar with the sequence of events that led up to the development of the Qik beta app for the BlackBerry Tour, continue reading so you have a better understanding how we got to this point. Last year when I joined the video-sharing site, Qik, I was excited to download their app to my new BlackBerry Tour so I could start streaming live video and upload previously recorded videos. However, after visiting their smartphone support page, I noticed that the Tour was not supported. At that time the Tour was on the market for only a few days so I understood that there might be a short waiting period before I got my hands on the Qik app. Since there was already support for approximately 125 smartphones, the BlackBerry Curve, Pearl, and Bold being among those supported, I figured it was only a matter of time before Qik developed an app for the Tour. After a couple months of patiently waiting, I decided to head over to the technical support Web site, Get Satisfaction, to see if there were any discussions taking place regarding the Qik app for the Tour. It turned out that there were several users requesting support for the Tour, but after reading through all the posts it became clear that there were no immediate plans to develop a Qik app. A post by Qik staffer under the name “jiuyu” said, “We are always working towards supporting more phones. Stay tuned and our users will be the first to know once Tour is supported!” Obviously Tour users, myself included, were disappointed to hear this news since there was still no solid information about the app. Everything appeared to be left up in the air and no real rush to develop the app for Tour users. According to the above post, Qik wasn’t sure if they would ever develop an app for the Tour so this just added to the frustration that many Tour users were already feeling. I believe the most frustrating thing about this situation is the lack of communication by Qik. It puzzles me how a company such as Qik can go several months without communicating with its users knowing they have been waiting months for some kind of status update on the app. A lot of users began to express their frustration and disappointment on the Get Satisfaction site at this point while others simply gave up hope and started to look for alternatives. Although the above post made it very clear that Qik was not calling for app beta testers, I found the post to be a weak attempt to keep Tour users at bay while Qik figures things out behind the scenes. 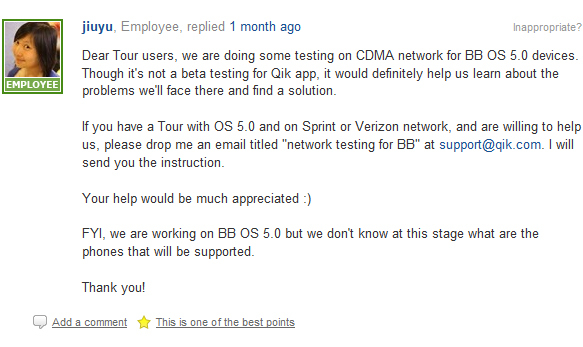 As you can see, Qik is asking Tour users running OS 5.0 to help the company with “networking testing for BB” only – not an app for the Tour. The post closes with “FYI, we are working on BB OS 5.0 but we don’t know at this stage what are the phones that will be supported.” which clearly states that Qik has no idea which BlackBerry devices will be supported in the future and that they are just working on the OS 5.0. With all the rumors circling around about the new BlackBerry Tour2/Bold device for Sprint and Verizon users, most Tour users felt that Qik was simply waiting for the new BlackBerry to be released before they developed the app. However, today there appears to be some progress in the app’s development. According to the Get Satisfaction Web site, there is a Qik beta app available for beta testing. Although this is an early beta release, this is good news for Tour users who have been waiting almost 8 months to snag the app. There are some limitations when using the app, but at this point it’s a step in the right direction and I’m sure many Tour users will be pleased to hear there is finally some progress being made. If you are a BlackBerry user running OS 5.0 on your device and are interested in beta testing the Qik app, please send an email to support@qik.com with “BB Beta Test” as the subject and they will email you the app for beta testing. It’s unknown if Qik felt the pressure of all the Tour users who expressed their frustration and disappointment on Get Satisfaction or if it was the many users who sent tweets to Qik’s Twitter account inquiring about the app for the Tour. We can only hope that in the future there will not be a breakdown in the communication process and that Qik will address these types of issues in a timely manner instead of placing them on the back burner. 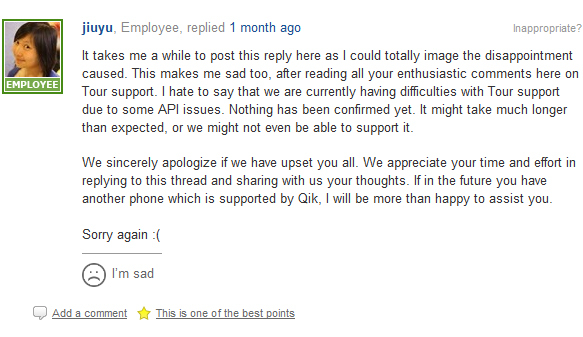 I think most users would agree that Qik’s lack of communication was the most frustrating not to mention very unprofessional. With that said, I like to applaud Qik and their mobile development team for finally investing the time and energy needed to develop an app for the Tour despite the API issues they were facing. It’s no secret that developing apps for the BlackBerry platform is not the easiest task so I’m just glad they finally put something together for Tour users. I am currently waiting for my Qik app to be delivered via email so I can beta test it. In the future, Qik might want to consider dedicating a page on their Web site to beta client downloads to eliminate the manual process of responding to user emails for beta testing purposes. Nonetheless, once I put the app through a few tests I will be sure to report back and post the results. In the meantime, go grab your Qik beta.